What went wrong? What made a Woeful Dark Ale? Three weeks ago, I decided that time was up for a new stout batch. Digging[true] through the Alcoholery's cupboard, on the shelves were a can of Oatmeal Ale mixture, some old dark liquid malt, bag of lactose and a bag of glucose. And a bag of choclate'd malt grain. And liquorice essence. Should be enough to make a dark ale at least. I wanted to make a "Whitbread/Mackesons Milk Stout" type. This would have to do. The can was at least four years old, so the yeast was probably not going to work. The malt was looking a bit sad. So I boiled the lot up, grain was pressure cooked then rinsed through, and the can instructions said it made enough for only ten litres. Whoa- but I thought with all the extra stuff, made it up to about 25 litres. Added the yeast and nothing. A week later, tasted okay, racked to another 30 litre vat to settle it out. Should have been sooner, sue me, but also let that vat sit for a week too. WRONG move. Two days should have been enough. Worked out at about 5% on the vinometer. Last night, cracked one bottle in order to share with eldest progeny, and then a second in disbelief. The dang ale/stout was FLAT! No carbonation after almost two weeks. Either the seals are buggered, or there was no yeast left in the liquor to carbonate with the teaspoon of sugar per bottle. 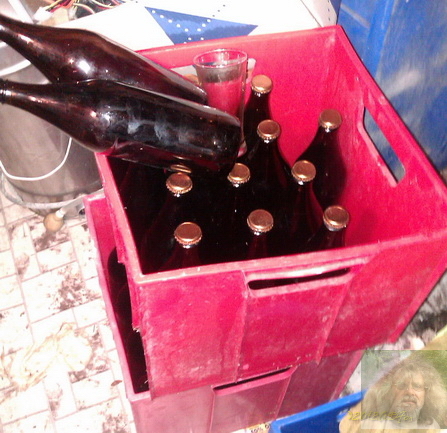 Looks like a batch to d'stil from, at 6% should recover something from the odd 25 liters. If you make home brew- any suggestions? What went wrong with my Woeful Dark Ale? I welcome some comments on this.